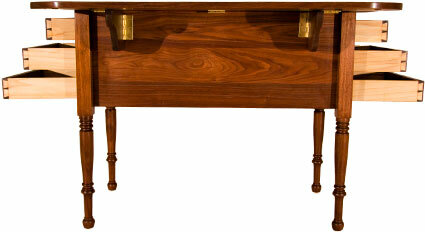 This strikingly handsome yet very functional table is without a doubt the most versatile piece in our collection. 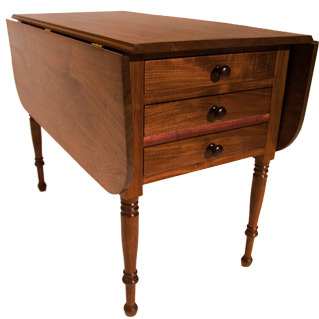 Residing in General Robert E. Lee’s office in Lexington, VA, the table features two drop leaves and six hand dovetailed drawers. Where floor space and storage are at a premium, this table can comfortably seat four and hold the linens, candles, and silverware for your meal. 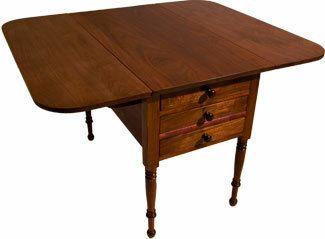 The table displays well under a window, against a wall or as a room centerpiece or major end table. Contact us to place an order.